AdAlta has utilised the unique structure of the i-body to develop a proprietary library containing over 20 billion i-body compounds. The library can be rapidly screened against a disease target of choice, to identify i-bodies specific for a range of therapeutically-relevant targets, and develop treatments for many conditions. Once an i-body is identified to have affinity and specificity with a drug target of interest, its effectiveness is evaluated in cell based assays (in vitro) and in animal experiments (in vivo). 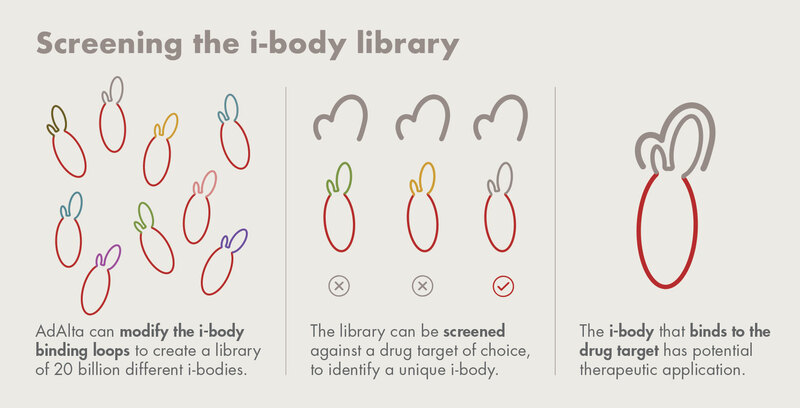 AdAlta has screened the i-body library to find a match with approximately 20 drug targets to date, and has identified i-bodies that bind to the target in each instance. A number of diseases remain difficult to treat due to the complexity of the target responsible for the disease pathology. These complex target molecules include G protein-coupled receptors (GPCRs) and Ion Channels, both representing large classes for potential therapeutic intervention. Modern medicine typically drugs these complex targets using small molecules, but this approach is not specific or efficient, resulting in unwanted side effects and underwhelming effectiveness. The i-body, with its long loop for greater access and high specificity for its target, provides an opportunity to selectively modulate and drug these previously undruggable targets. G-protein-coupled receptors (GPCRs) are the largest and most diverse group of receptors found in humans. The 7-transmembrane proteins form deep pockets in which drugs bind to activate a number of signalling pathways causing various downstream effects. GPCRs are involved in a wide array of diseases including diabetes and obesity and are the most heavily investigated class of drug targets. 25% of the top 200 selling pharmaceuticals target a GPCR, with a total market of $82 billion in 2016. 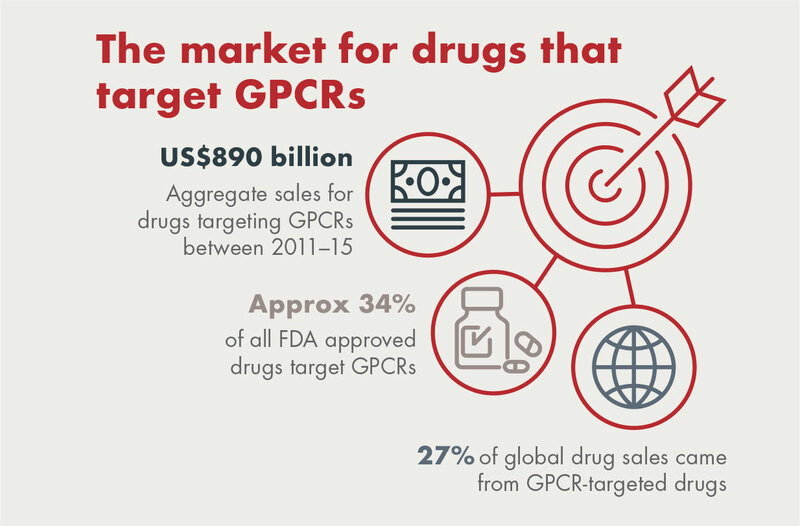 Despite a significant market size, over 80% of GPCR targets are yet to be effectively exploited, due to the inability to identify specific binders that treat patients without unwanted side effects. AdAlta has screened its i-body library against four GPCR targets and identified i-bodies that bind to the target of interest in each instance. AdAlta’s lead candidate, AD-214, binds to the GPCR target CXCR4 with the long loop binding deep in the GPCR groove. The unique structure of the i-body has resulted in distinct pharmacology. Fibrosis expert Cory Hogaboam observed anti-fibrotic activity of the AD-214 i-body in IPF patient tissue that was not replicated by other CXCR4 small molecule binders. An Ion Channel is a receptor on a cell surface that allows ions, including calcium or phosphate, to move in and out of the cell. The movement of ions is vital for the function of cells in the nervous system, contraction of heart and skeletal muscle and secretion in the pancreas. Ion Channels can be opened and shut in response to an electrical stimulus (voltage-gated) or binding of a drug compound (ligand-gated). Currently only 8% of Ion Channels have been commercially exploited, with many Ion Channels implicated in disease states yet to be targeted by novel therapeutics. 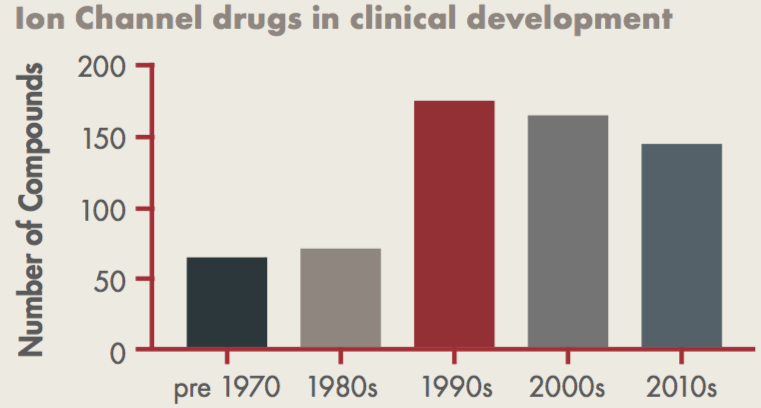 A lack of understanding around the mode of action has led to side effects and a significant slowing in approved products, despite continued clinical development. A successful strategy to develop highly specific Ion Channel modulator drugs has the potential to address a number of therapeutic indications. These include pain, oncology, inflammatory and fibrotic diseases.